At a Christmas party in South London in 1976 John Bayley, Ken Dampier and Colin Minchin made the fateful mistake of performing (with a borrowed bassist and drummer) two of the songs they'd been wisely hiding for years. The success of this performance, due largely to the benevolent nature of the Christmas-Spirited audience inspired these three lads to form a band of their own. As all of them played the guitar, they needed a bassist and a drummer, so they asked an old friend, Peter Hornsby, to join them on keyboards. Peter agreed, despite the fact that he played the guitar too. These four looked no further than their local pub before finding their fifth guitarist, Howard Edgar. Howard was a serious and dedicated drinker, who at some stage in his career had picked up a bass guitar by accident. Luckily for the embryonic band, he agreed to play bass as long as his glass was constantly refilled. When Fiona Imlah and Beverley Glick foolishly decided to sing with the five guitarists the die was cast. Because they had no drummer "The Five Guitars" would sit in The Three Tuns in Beckenham trying to think of better names, and when Stewart T. Booth, who had never played the guitar in his life, suggested that the band was called Tennis Shoes he was immediately offered the embarrassing task of singing one of the group's compositions entitled "Black Leather". This was it. Vic, the borrowed drummer, came back and the band started rehearsing frantically when there was nothing better to do. As the great day set for Tennis Shoes' Penge debut approached, Vic was reclaimed by a more serious outfit and Derek Thomas joined the band in time to mess up his solo on the opening night. 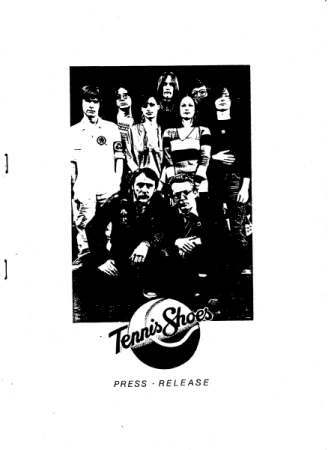 Strangely, everybody laughed at Tennis Shoes, and they continued to play in Penge, occasionally venturing further afield to perform in venues like the notorious Rat Club (really) in London's exotic King's Cross. But something was wrong, and in a series of devious manoeuvres involving women, bribery and threats. Tennis Shoes second drummer left. Luckily Glen Morris, (who may have played the guitar occasionally), left a lucrative pop group and neglected his studies to join Tennis Shoes. He felt immediately at home, largely because the band only played once every six weeks. But fate took a hand, and a series of coincidences found the complete 9 piece band back in Penge, where a devoted crowd of people with no taste flocked to their every performance. This support encouraged a new enthusiasm, which led to offers of gigs in Colleges, London pubs and village halls. Success followed success, and now as the Summer of '78 draws upon us. Tennis Shoes are expanding their operations by negotiating with obscure record companies, playing bigger and better venues and moving into sportswear, restaurant chains and nicer residential areas. Always proud of their suburban origins and true to the timeless British philosophy of "Gentlemen, rather than players" Tennis Shoes are forging into the latter part of the atomic age with all the style, wit and excitement of rose patterned wallpaper. 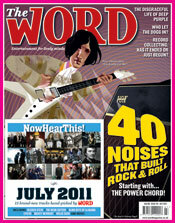 Pete Hornsby, Fiona Imlah, Colin Minchin and Glen Morris, They all play guitar.